GOF is a closed-end fund sponsored by Guggenheim, seeking total return through a combination of capital gains and current income across numerous fixed income and equity markets. The fund currently yields a 10.94% distribution and is trading at a premium of 11.69% to its net asset value. We take a deep dive into the fund to identify if it fits your portfolio today. 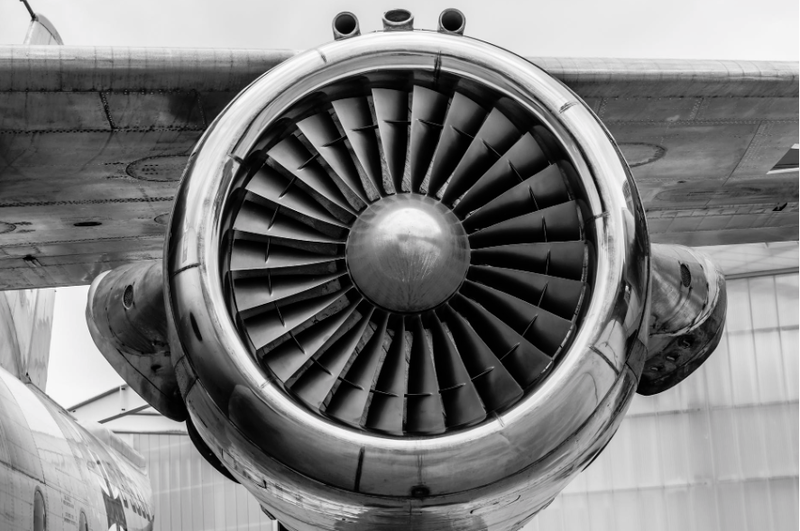 For as long as I can remember, I always was intrigued with and infatuated by aviation. I have taken some private lessons, and while traveling for work, at least before my girls were born, I would go out of my way to travel with extra stops. Not only did it mean more time in the air but more airline miles and more chances of getting upgraded to the pointy end of the plane. As a financial professional, I always admired and respected Guggenheim and Scott Minerd. Naturally, when I learned about the Guggenheim Strategic Opportunities Fund (GOF), a fund run by Scott Minerd that had meaningful exposure to aviation leasing, I was quite giddy and excited. I wrote about this fund a year ago in my article, "GOF - The Popular Fund You Should Not Marry Into Your Portfolio." Despite having an awesome strategy, a great management team and a good sponsor behind them, the "grown up" in me, thinking with my head, could not in good conscience purchase this fund or recommend it to clients. There were a number of reasons for this. First, the fund was trading at meaningful premiums to its NAV and, generally, closed-end funds trade at a discount. One of my personal tenants of CEF investing is that I do not pay a premium for CEFs. Beyond that, the underlying fundamentals for speculative type funds were changing with both rising interest rates and deteriorating fundamentals. This would have a negative impact on net investment income and distribution coverage. Now that a year has passed, let's take a look at the fund to see what's changed! Did the underlying net investment income take a tumble? As we know, the last two years have been quite eventful, especially for closed-end funds. With the majority of the closed-end fund universe being leveraged, investors have been coming to a rude awakening as funds have started to meaningfully cut distributions as their coverage ratios declined. All of this stems from the problem that closed-end funds borrow at short-term rates and invest in longer term securities. Ordinarily, this is not an issue as longer term rates are higher than short-term rates thus you can borrow cheaply and invest in higher yielding securities. I discussed this in my most popular and perhaps most controversial CEF article yet, "Are You Sitting On A CEF Time Bomb?" 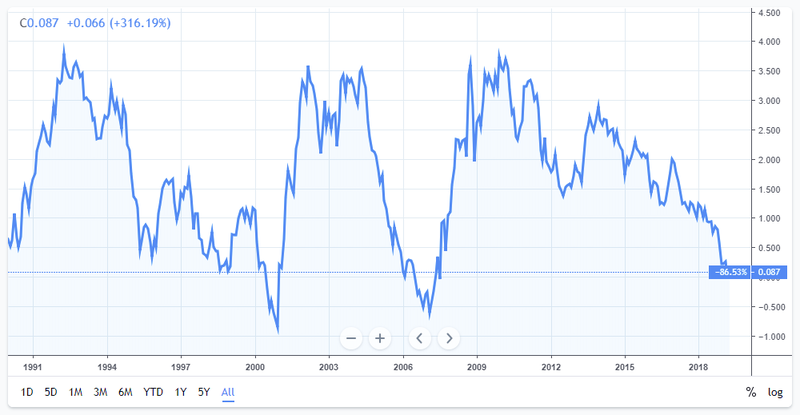 In the last few years however, the general trend has been for an increase in short-term borrowing costs while long-term rates remained flat. 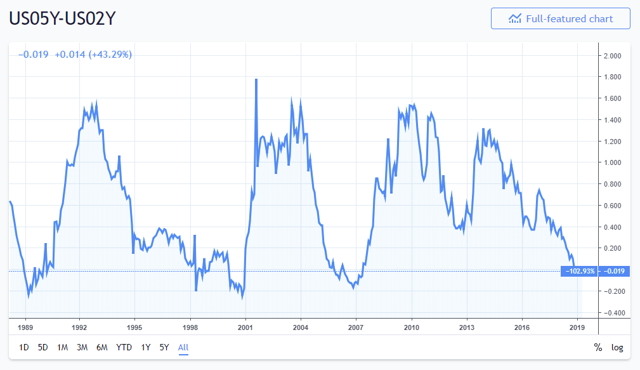 In the last six months however, not only have short-term rates continued to increase, but longer-term rates declined to the current flat to inverted yield curve. And the 10-year Treasury to three-month T-Bill spread is essentially zero. This is not normal, not for the economy nor for closed-end funds. AUM: $620 million in investment exposure, $617 million common assets. Fees: 1.16%, down from 1.8%. Sources: CEF Connect, Guggenheim Website, and YCharts. The largest change we see with the fund is that since our initial article, the fund has essentially fully delevered. This, in turn, lowered the annual expense to 1.16%. The fund however still trades at a massive premium to NAV. One of my favorite reasons for looking at this fund and Guggenheim is for their strong experience in asset-backed securities and in particular my area of interest, aviation. Even though this is an actively managed go-anywhere fund, it is not overly concentrated. It has however gotten more concentrated from a year ago. The top 10 holdings make up 11%. This is up from just 7.98% of the fund. 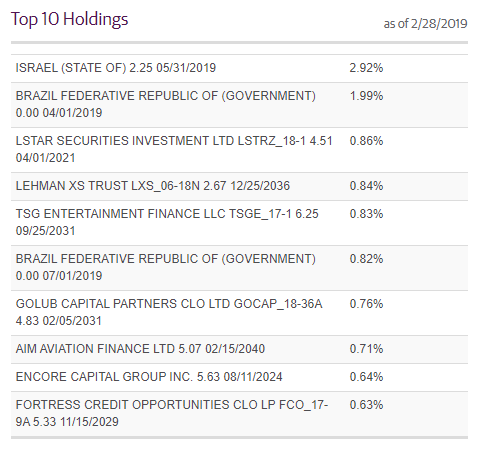 Some of the more interesting changes are the increased holdings of Israeli and Brazilian sovereign bonds. Looking at the fund more broadly, even though it can allocate up to 50% to equities, the fund is currently 85% allocated to fixed income with just a little over 15% allocated to common stocks. From last year, the fund has transitioned its preferred stock exposure to pure fixed income. Surely, the fund is becoming more conservative. Breaking it down further shows us a fairly diversified portfolio. We do find ABS and Bank Loans making up more than 50% of the portfolio. The largest change we can find is the fund meaningfully cutting its high-yield corporate bond exposure from over 14% of the fund to under 8.5%. The managers have also commented on this in the latest fund commentary. This obviously shows up in the credit quality where we find the majority of the fund being below investment grade. Since last update, the fund has however trimmed up its junk bonds and even moved up a bit in its AA exposure. As we discussed before, the fund does not publish some common statistics such as the average effective maturities and durations. The data we do have is published in the reports. Guggenheim does disclose that the fund had an average duration of about .7 years, which is quite good. This implies the fund will have minimal impact due to changes in the underlying interest rates. What this means is that for a 1% rise in interest rates, the fund's NAV should be expected to decline by just .7%. The same also is true for the inverse. If the Fed lowers interest rates 1%, the fund's underlying NAV would increase by .7%. This is why during times of decreasing interest rates many investors will want to go "long" duration. Looking at the risk data we find a major change. Since last year, the rolling five-year BETA of the fund dropped to .7977! This is down from a five-year beta of .997. This implies that the fund now takes about 20% less volatility than the underlying markets, down from being as volatile as the underlying markets. I'm sure a good amount of this is related to the deleveraging of the fund. 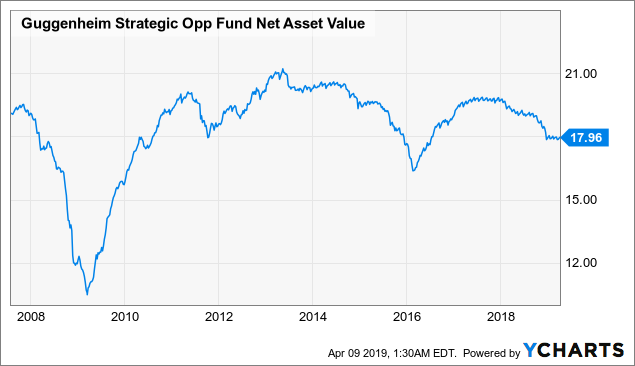 The maximum drawdown which the fund experienced remains the same at 54.69%, likely attained during the closed-end fund sell off in 2007/2008 when the leverage markets dried up and funds were forced to liquidate. Looking at the risk-adjusted metrics, the fund has achieved a 10-year Sharpe Ratio of 1.629, up from .7935, and a Sortino ratio of .6941. While these are not mind blowing... for a closed-end fund of this nature, it's quite good and improving. Like most closed-end funds, the Guggenheim Strategic Opportunities Fund has the ability to use leverage. The fund used two primary methods for obtaining leverage, first, through reverse repurchase agreements, and secondly, through an $80 million credit facility. Today, however, the fund is essentially unlevered. 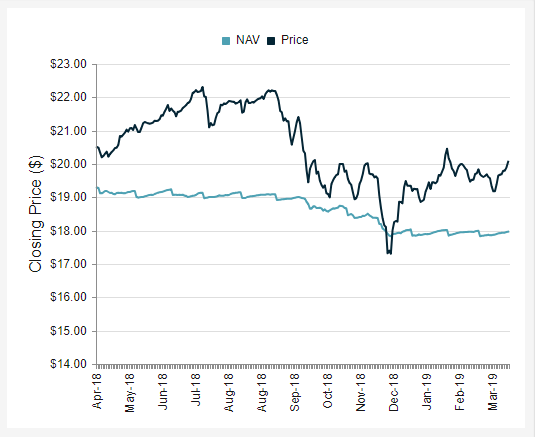 This is both a very positive sign for risk aversion, but also a very negative sign for distribution coverage and has been clearly seen in the NAV destruction over the last 12 months. The fund currently distributes a $.1821 per share monthly distribution. The distribution has been steady over the previous few years, despite the low interest rates. The current market distribution yield is 10.94% as of 4/9/2019. Last year I screamed about numerous warning signs in the distributions, primarily more and more of the distribution being paid out from long-term gains and not net investment income. Looking at the fund's distribution classifications starts showing some big warning signs. Generally, we want to see a fixed income CEF's distribution be covered from income, in particular its net investment income. When we look at GOF's distribution classification over the previous few year we find that so far this year, the vast majority of the distribution is classified as coming from realized long term capital gains. If we go back to 2016 we find that the fund has paid return of capital. 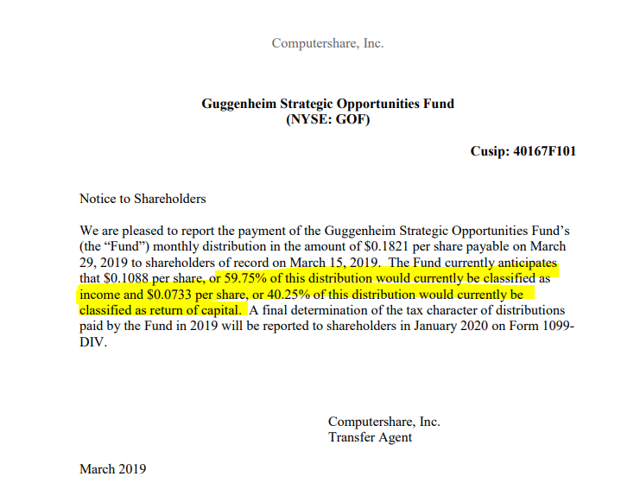 As of the latest published financials, CEF Connect estimates that the fund earned an average of $.1155 per share yet paid out over $.1821 per share. Surely an issue. Source: "GOF - The Popular Fund You Should Not Marry Into Your Portfolio"
Today, more and more of the distribution is return of capital, much of which is destructive RoC. As we were reminded in my previous articles, CEF Connect data is not always correct. Furthermore, since it gets its data from Morningstar, you have two big resources that may not have the right information. As such, we look at the actual underlying financial statements and 19a notices. 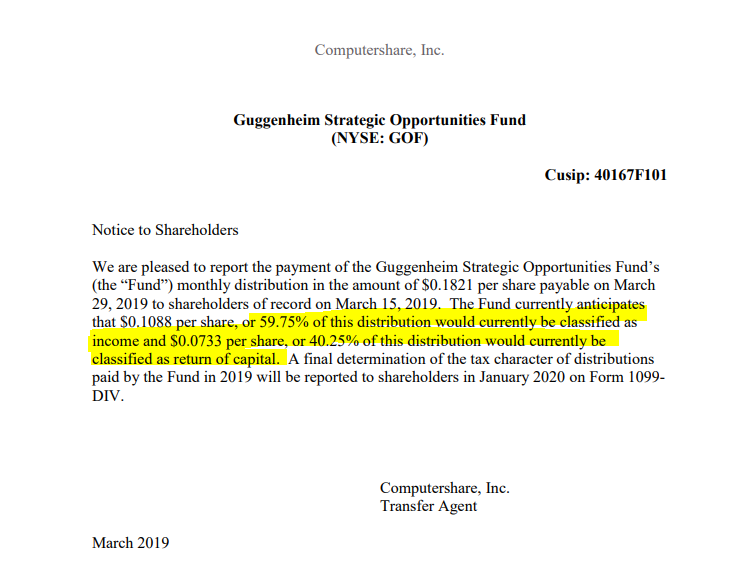 If we go to our latest March 19a Notice, we find that the fund is estimating that 40% of its latest monthly distribution will be return of capital. Next, we can look at the latest income statement found in the semi-annual report for the period ending Nov. 30, 2018. For the six months ending Nov. 30, 2018, the fund earned $17.697 million in income. This is down from $19.580 million for the same time a year earlier. The fund had a total of $3.259 million in expenses for the same six months including $2.822 million in management fees. This compares with $4.154 million in expenses for the year prior. The savings were from significantly lower interest expenses due to deleveraging. The net investment income, however, declined to $14.438 million from $15.426 million a year prior. Ideally, we want to see income funds cover the entire distribution from net investment income. The fund is actively managed and does trade securities. As such we also look at the realized gains/losses and the changes in the underlying value in the portfolio. 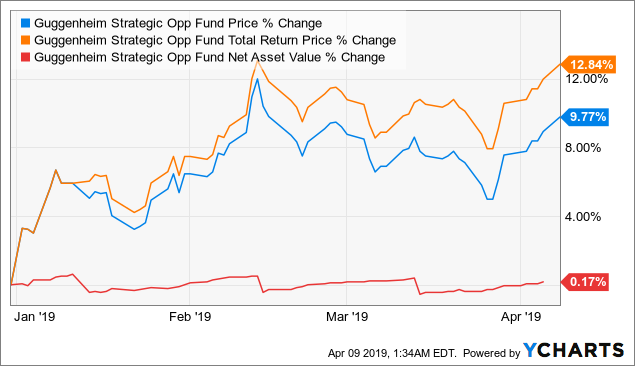 The fund earned money on investments and futures contracts, however, lost a bit of money on its options writing strategy. The net result was $5.67 million in investment gains. This is up slightly from $5.25 million a year earlier. Funds also are required to mark to market the market value change in their portfolio even though they have not yet realized those gains or losses. The fund's investments declined nearly across the board and the fund had a $14.7 million unrealized loss. As such, between the realized gains and unrealized losses, the fund had a $9.05 million change in value. Taking the $9.05 million net realized/unrealized loss against the $14.438 million in net investment income left the fund with a gain of just $5.391 million. 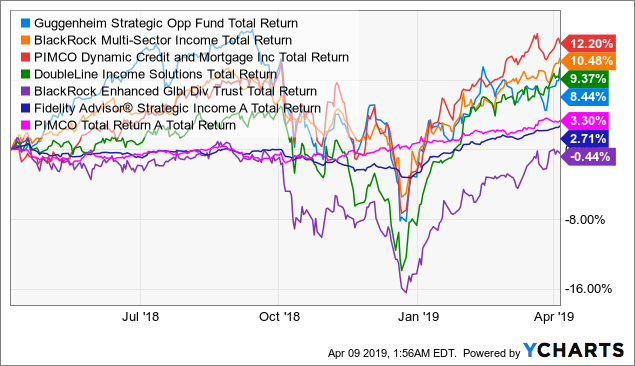 Obviously, for fixed income funds, the loss is only there when it's realized, and in this case, the portfolio underperformed due to rising interest rates. The main problem, however, is not the trading side of it, but the gross over distributions. 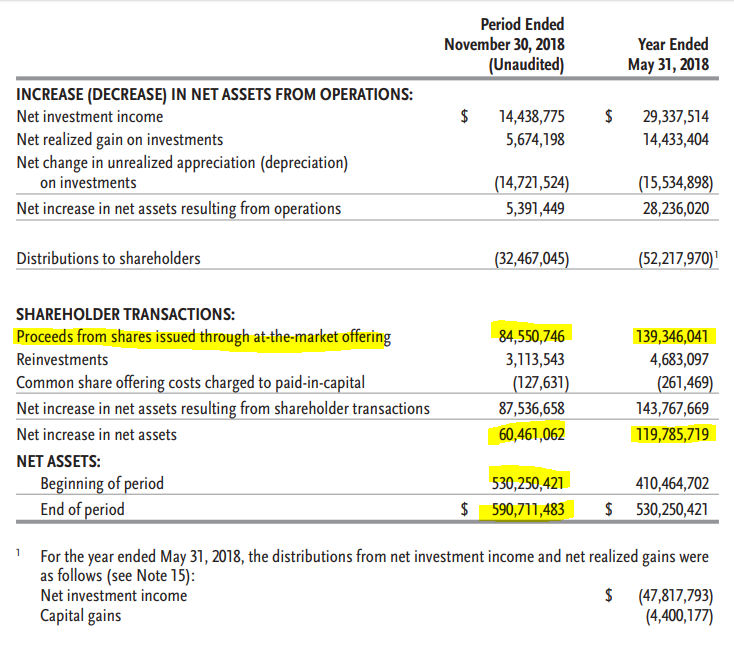 As we can see below, the fund had $14.438 million net investment income and a $5.391 million net investment increase. At the same time, the fund paid out over $32.467 million in distributions! OK, so was this a fluke year? GOF gives us a five-year history. As we can clearly see, only ONCE in the last five years did GOF cover its distribution, in the 12 months ending May 31, 2017. Furthermore, NOT ONCE was the distribution covered from net investment income. (During the last five-year period.) In EVERY case, the fund only covered using its capital gains. Last year I had some really rough comments for the fund's performance. I will tone it down today, but the answers are still the same. So is the distribution covered/safe? No! Not really. Is the fund going to continue paying it? Probably! As we know, the vast majority of investors do not understand the difference between an earned dividend and a paid out distribution and sponsors don't go out of their way to educate the investors. The steady "dividend" is how the funds are generally able to keep investors invested while they offer new shares to raise the capital while at the same time increasing their management fees. Which is what the fund continued to do during 2018. If you are a new subscriber or have not done so yet, please take a look at my article discussing distributions, CEF School - Distributions 101 - Distributions Are NOT Dividends. The fund is currently distributing a market price distribution yield of 10.94% and is trading at a premium of 11.69% to its NAV, or net asset value. Over the previous year, the fund has continued to trade at premiums although it did trade at a discount for a few days in fourth quarter2018. That would have made a great opportunity to get in on a trade. As we discussed last year, the net asset value has failed to grow beyond its initial IPO even though there is a growth component in this closed-end fund. This is quite consistent with the findings of the distribution analysis. A few good years bail out many bad years, however, there has not been meaningful growth since the fund crashed in 2009 and subsequently rebounded. Looking back over the fund's lifetime, we can see the fund has generally traded at a premium since 2009. There were a few occasions to get in at a discount, typically occurring during a broad market sell off. Surprisingly, however, despite the fund being grossly over distributing, investors have continued to pay premiums for the name. Performance wise, year to date the fund has participated in the market rally. Investors achieved a total return of 12.84%. The fund's price per share increased 9.77% while the net asset value increased a mere .17%. 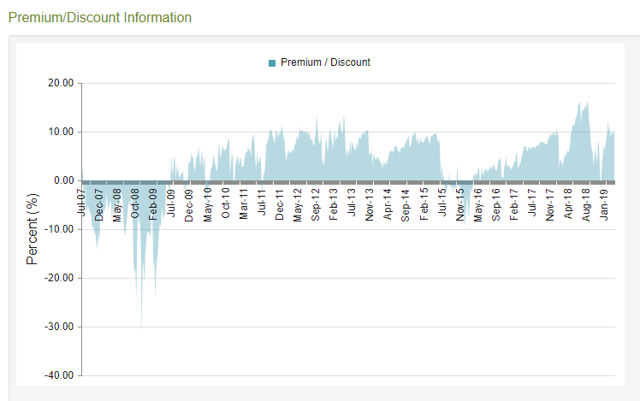 This implies that the largest driver of the total return in 2019 has been the discount to NAV shrinking, or more specifically, the PREMIUM increasing! 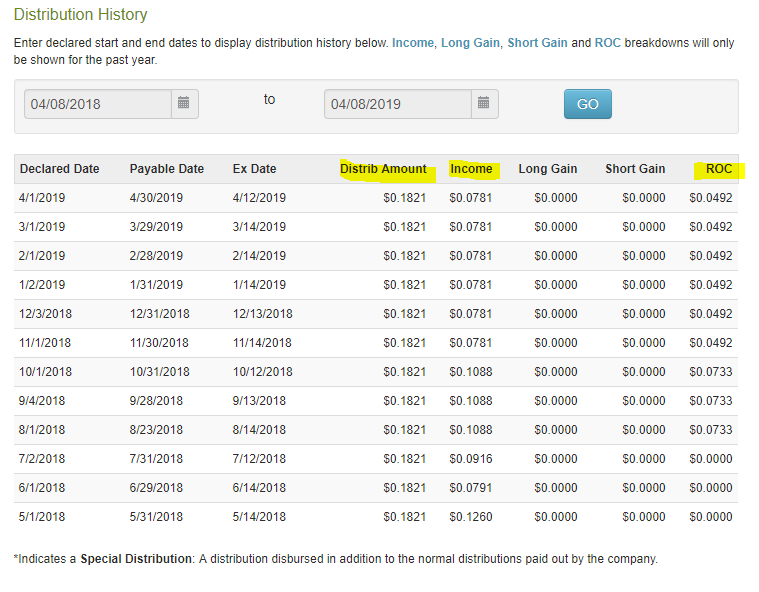 Since our last article on May 5, 2018, the fund achieved a 5.13% total return. The price per share declined 4.64% while the NAV declined 6.17%. Since that article, the premium continued to increase. Over the previous year, the fund gave investors a 9.29% total return. The price per share declined 1.74% while the NAV declined 6.56%. Yes, the fund did earn interest... but it over distributed and was saved by the premium to NAV increasing. The last three years have been good, however. The fund gave investors a 61.97% total return. Helped by the meaningful interest rate hikes and the predominantly floating rate focused portfolio, the price per share increased 16.94% while the NAV increased 5.46%. Yes, during this time, the premium over NAV increased by over 11%. To put the fund into perspective, let's take a look at the same competing products as we did before. 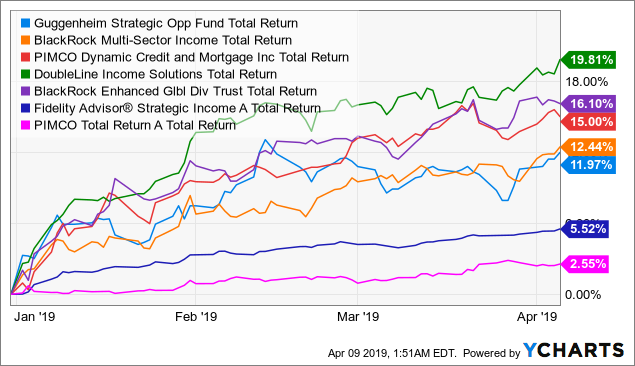 From the "go anywhere" CEF bucket, there are a number of competing funds such as the BlackRock Multi-Sector Income (BIT), the PIMCO Dynamic Credit Income (PCI), and the DoubleLine Income Solutions (DSL) funds. PCI is managed by the PIMCO team and the DoubleLine fund is a representation of the famed Jeffrey Gundlach's ideas. Furthermore, we looked at the BlackRock Enhanced Global Dividend Fund (BOE) which is a covered call focused investment. 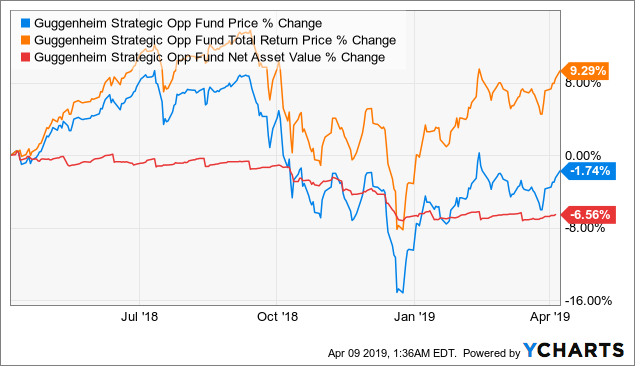 Lastly, we looked at the fund against two unlevered open-end mutual funds, the Fidelity Strategic Income (FSTAX) and the PIMCO Total Return (PTTAX) funds. Year to date, GOF has lagged all of its closed-end fund peers. 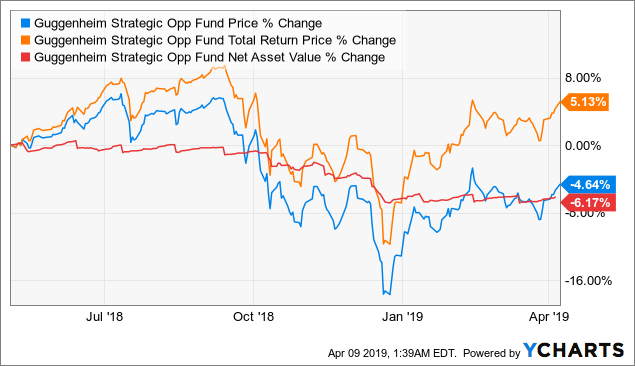 The closed-end funds did outperform as expected over their open-end funds as a large driver of the return was the discounts to NAV shrinking. Furthermore, GOF is now unlevered, and as such would lag behind other levered CEFs. Over the last year, the picture is nearly the same. 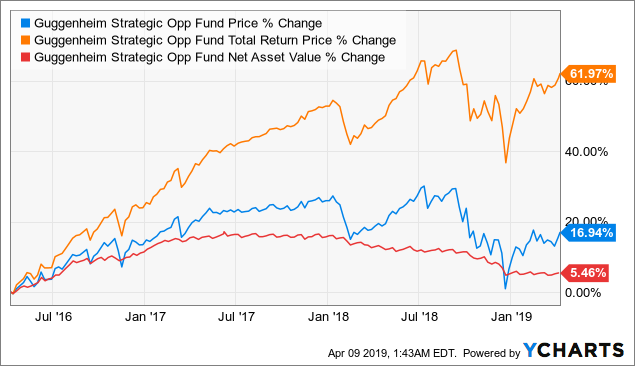 What's most evident however is that the two open-end mutual funds were largely immune from the Q4 sell off, even if they were invested in similar assets. Over the last three years, we have a similar story. PCI lead the way followed by GOF, DSL, and BIT. 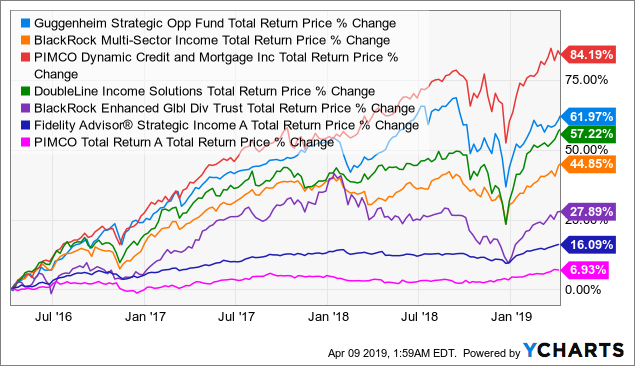 Overall, GOF has been a good performing fund, especially as it has been far less levered than its peers. It has of course been meaningfully helped by investors being willing to pay a premium. Most recently, the fund has become unlevered and we have definitely seen it play out in the distribution coverage and the NAV taking a hit due to the destructive return of capital. Over the last few years, funds like GOF, PCI, DSL, and others have been popular as they generated above-average yields in harder to reach asset classes such as asset-backed securities, derivatives, and commodities. For that privilege, investors have been willing to pay premiums while quality focused funds have been overlooked. Of course, these asset classes have performed well in a low interest rate environment, but perhaps Guggenheim is trying to tell us something with the fund deleveraging and increasing quality. Last year, I was willing to invest in the fund if the fund traded at a discount. Today, however, with the significant over distribution and the premium to NAV, this fund is definitely on my avoid list. Bottom line, I would certainly love to own the fund, but perhaps when the prices are quite a bit better and we have another opportunity to buy in ONCE the tornado comes through. In the meantime, I would look at BlackRock's (BIT) or (BTZ) which lets you invest in the same space at a far lower prices, discounts of about 10% vs. a premium of more than 11%. Furthermore, both of those funds are covering a larger portion of the distribution through net investment income. For more information on the fund, please visit the fund's website at Guggenheim - GOF. I hope you found this article helpful, especially the Income Idea look at the distribution quality.